The Assam Pradesh Congress Committee (APCC) has submitted a memorandum to the President of India Ram Nath Kovind on Friday slamming Modi government’s decision to remove CBI Director Alok Verma. The APCC also staged a protest demonstration and gheraoed the CBI office in Guwahati. Congress demanded the reinstatement of the CBI Director Alok Verma, who’s removal they claimed was arbitrary and illegal and was done at the behest of Prime Minister Narendra Modi. They termed the move as unconstitutional, systematic dismantling and degrading of the autonomy of the nation’s top investigation agency CBI. The APCC leaders sought intervention of the President in this matter. The memorandum also alleged that the Central Government in a bid to save its own skin, picked Rakesh Asthana, who is being investigated by the CBI on charges of corruption. They alleged that the BJP Government wanted to cover up its involvement in Rafale scam. The memorandum also mentioned former union ministers Yashwant Sinha and Arun Shourie and lawyer Prashant Bhushan who have approached the Supreme Court alleging “criminal misconduct” by top officials of the union government in the Rafale deal, requesting an FIR be registered on the matter. The memorandum alleged that the decision to remove CBI Director Alok Verma came in the wake of investigations initiated by Verma on the Rafale deal. The Modi government was panicked over the investigation which is why they violated established law under Section 4 of the Delhi Special Police Establishment Act 1946, where the CBI Director was forced to go on leave. The memorandum demanded the reinstatement of the CBI Director and an apology with ‘folded hands’ from Prime Minister Narendra Modi. It also demanded freedom for CBI Director Alok Verma, to investigate the Rafale deal. 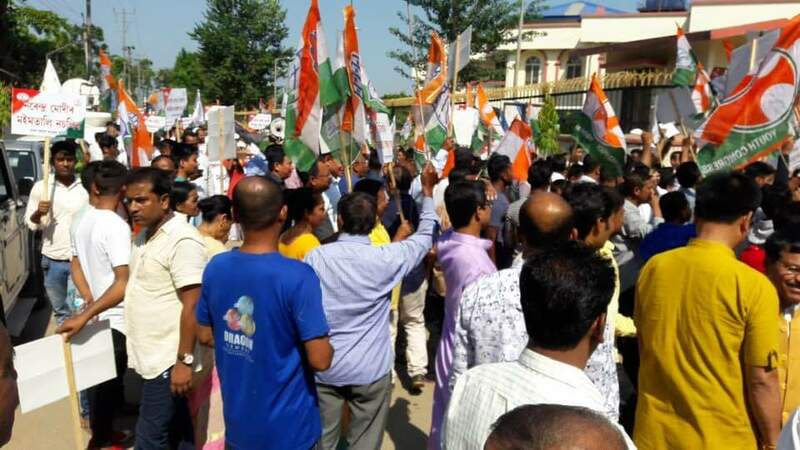 “We are protesting against PM Narendra Modi’s disgraceful attempt to prevent an investigation into the Rafale scam by removing the CBI Director Alok Verma,” said Ripun Bora, President, Assam Pradesh Congress Committee (APCC) who led the protestors.